I was recently reading the 2012 article by James R. Irons and colleagues describing the Landsat-8 mission (or Landsat Data Continuity Mission, LDCM, as it was then called)¹. They do a very good job in describing the mission from planning to inception. I like to think of this paper as a guide to how not to plan an Earth Observation mission. Here’s my reasoning. “Development of the remote sensing market and the provision of commercial value-added services based on remote sensing data should remain exclusively the function of the private sector”. “Despite the success and importance of the Landsat system, funding and organizational uncertainties over the past several years have placed its future in doubt and have jeopardized United States leadership in land remote sensing“. Subchapter IV went on to state policy for the follow-on to Landsat-7 (i.e. the LDCM or L8). “If a successor land remote sensing system to Landsat 7 can be funded and managed by the private sector while still achieving the goals stated in subsection (b) of this section [describing the goals of the mission] without jeopardizing the domestic, national security, and foreign policy interests of the United States, preference should be given to the development of such a system by the private sector without competition from the United States Government”. The US government then started planning the LDCM. To save costs NASA was directed to plan for the incorporation of Landsat sensors on NPOESS, a polar orbiting meteorological satellite system. NPOESS was ambitious; adding another sensor was probably not the best idea. Adding another government agency to a program already struggling with inter-agency coordination was a recipe for disaster. NPOESS was doomed; the LDCM system was reassigned well before the end. It was recognised that the LDCM would be best served by a free-flying solution; LDCM would be a dedicated Landsat type satellite. Finally, Landsat-8 was starting to take (a sensible) shape! 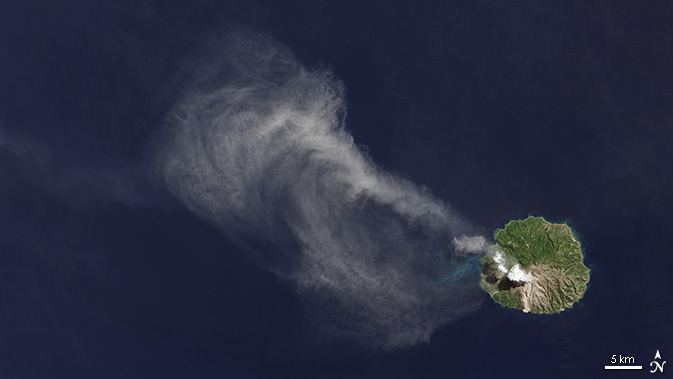 A Landsat-8 OLI image over an Indonesian volcano (image credit: NASA). The LDCM component of NPOESS was to have been the Operational Land Imager (OLI). A visible- shortwave infrared (SWIR) imager with Landsat-6/7 like properties. OLI would cover a wide swath (185 km), offer high resolution imagery (30 m GSD), have band widths and centre wavelengths like it’s predecessors and offer improved signal to noise ratios and geolocation. Two new bands were planned; a visble-blue band for coastal applications and a cirrus-cloud identification band to improve cloud detection. But the panchromatic band, Band 8, would be narrower (see Part 2). End of story? Sadly, no. “Thermal imaging was initially excluded from the LDCM requirements in a departure from the data continuity mandate…The benefits of thermal images were not deemed worth the cost of the capability in the early LDCM formulation efforts”. (Irons et al., 2012). The thermal band(s) were dropped early in the LDCM planning: Irons and colleagues blame the lack of a perceived commercial application of thermal data. Under the NPOESS planning phase there wasn’t the space on the platform for another sensor so the thermal imagery remained excluded. Pressure from science (pdf) for a thermal imaging capacity had been constant. Even the States were pressuring Congress. However, lobbying by agricultural interests was instrumental in arguing for thermal imaging and a thermal infrared (TIR) sensor was approved for inclusion in 2009, only three years before the planned launch data. Rapid sensor development ensued leading to a number of compromises. The TIR image GSD was to be 120 m, not the 60 m, Landsat-7’s ETM+ instrument was to offer. The instrument was to have a three-year design life, two years less than the OLI, on a satellite with fuel for 10 years of operations. All this is likely to have left many potential users distinctly underwhelmed. The renamed Landsat-8 was launched in 2013 carrying visible to SWIR and TIR instruments. The data looks good, and is free! Landsat-8 is collecting a nominal 400 scenes a day, up from 350 under the Landsat-7 data acquisition plan. It is hard not to come to the conclusion that the job of planning and building satellites should lie with NASA (period!). Congress has the right and responsibility to decide funding and to ensure programs are delivered on time and on cost. As a tax payer I expect my elected representatives to ensure our money is spent wisely. Nevertheless, politics and possibly ideology, clearly resulted in delays, additional costs and sub-optimal development of the L8 mission and it’s components. In many ways we are lucky L8 was launched after the NPOESS fiasco: it is clear no mission is too big or too important to fail. Eventually, through no fault of their own, the L8 team delivered a valuable asset to the (global) science community; they are to be congratulated. That said it could have been done better. The US needs a better system for developing an introducing critical space infrastructure. In Part 2 I’ll share some thoughts about the design of the instruments and why I think in many ways L8 was a missed opportunity.